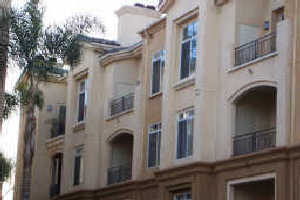 Located in La Jolla's 'Golden Triangle' with all the Ammenities! Top Floor Penthouse Condo w/Dual Master Suites w/12 Ft. Living Room Ceilings, Wood Burning Fireplace and Balcony. Upgraded Carpet and Granite Tile Flooring, Stainless Appliances and Euro White Kitchen Cabinets w/Granite Counters. Stackable Waher/Dryer in Hall Closet. Enjoy Shopping at UTC Mall, Close to UC San Diego and Restaurants. This Property Features Luxurious Ammenities for the Active Lifestyle: Gated Secured Entry, Underground Parking w/2 Spaces, Full Concierge Service, Business Center (Computer, FAX, Conference Rooms), Enjoy the 12,000 Sq/Ft Clubhouse that Features a Stadium Style Movie Theater w/10 Ft Screen (Reserve the Theater and Private Dining Room/Kitchen for Parties), Pool Table, Cabanas and Sports Bar, 24 Hour Fitness Center and More!! !